New Orleans’ annual Voodoo Experience is celebrating its 15th anniversary in 2013, and, as they did last year, the festival made an extra early initial announcement, this time revealing the first 15 acts to make up the festival’s lineup. Notably, Nine Inch Nails and Trent Reznor will return to City Park for the first time since NIN headlined in 2008. Reznor is set to perform with both Nine Inch Nails and his also exciting How to Destroy Angels project. Reznor is a former resident of the Crescent City’s Uptown area near my old ‘hood, making his return with both acts extra special. Also, Pearl Jam will be making their first trip to New Orleans in three years after Eddie Vedder notably had to cancel his solo appearance at Jazz Fest 2012. See the first fifteen acts after the jump Worship the Music. 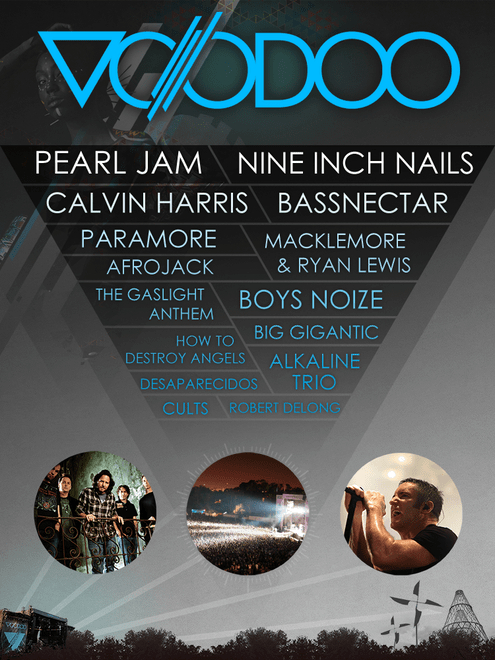 Voodoo 2013 takes place November 1st-3rd at New Orleans’ City Park Festival Grounds. Three-day ($175) and VIP ($550) are now available through the festival’s new website, with additional options for camping.